You're not seeing double-double: The contest is back for a second time this year. With mere days days left until the country's 150th birthday, it appears we have reached peak Canada. As proof, consider the fact that Tim Hortons' Roll up the Rim contest is back for a second time this year. The coffee and donuts chain announced the return of its hyper-popular contest on Wednesday morning, specifically timed for the Canada 150 festivities and running until July 21, "or until cup supplies last." Along with the usual raft of prizes there are 10 "ultimate Canadian vacations" valued at $10,000 each. "The grand prizes will give [winners] the opportunity to discover this beautiful country and design their own once-in-a-lifetime Canadian experience," Timmies said in a statement. One little difference this time around: On losing cups, the rim reads "Happy Canada 150th" instead of "please play again." That left some Timmies customers a little bemused. 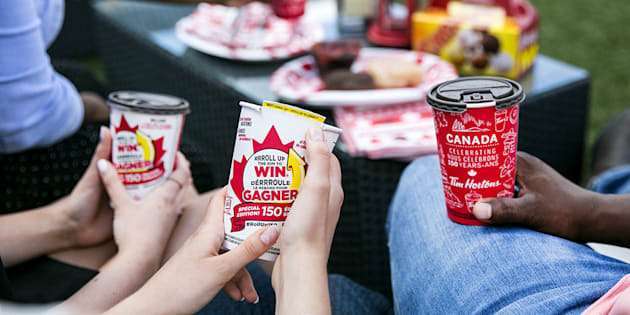 In all, the Canada 150 edition of Roll up the Rim to Win will offer up 16 million prizes, including 8,000 $50 Tim Cards. But as is often the case, customers are already grumbling about all the cups that aren't winners.